What is the one accessory your can carry around on holidays and any other occasion? The one item that is practical, stylish and can replace a handbag? I’ll tell you, it’s a backpack! I just got back from a 5 day Easter holiday in Milan, Italy and it was great. My daily routine consisted of eating as much delicious pasta, pizza and ice cream as I could. Combined with my 5’ o’clock happy hour of aperol spritz and aperitives, followed by the usual dinner drinks, wines and cava and my favourite drink in Italy, a single espresso. But that is not all, walking minimum 5 miles a day, visiting different places and napping once or twice a day, made this trip really unforgettable. And there wasn’t a day that I left the apartment without my little black leather backpack from Arsante of Sweden. From the airport to our everyday errands, I managed to keep our passports, papers and other small utilities in the small pockets and in the big compartment an extra sweater if needed or a camera (because we need a camera everywhere we go, right? ), some days even some groceries. 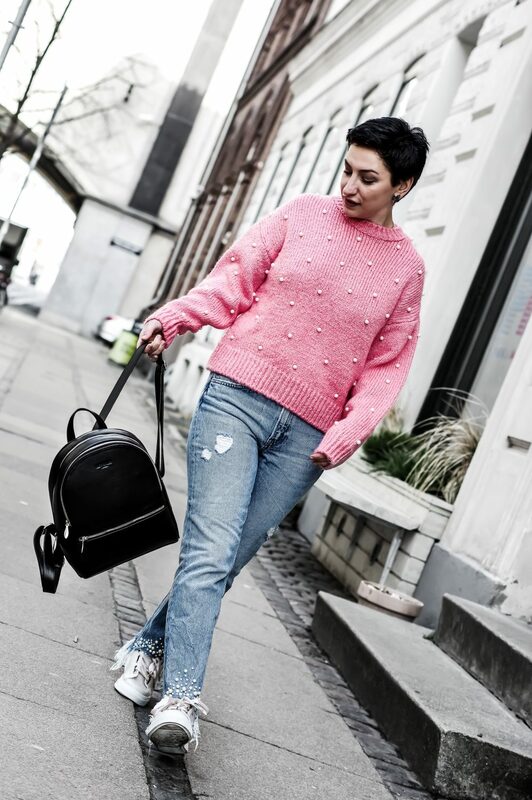 Lately, I aim for more comfortable looks and accessories and truth be told, I find having a backpack around in a busy day much easier than a handbag. Especially, a backpack like this that works with a business attire as well. When it comes to accessories, backpack and bags I always opt for leather. I prefer investing in something that lasts a lifetime, ages well and nothing is better than leather, right? 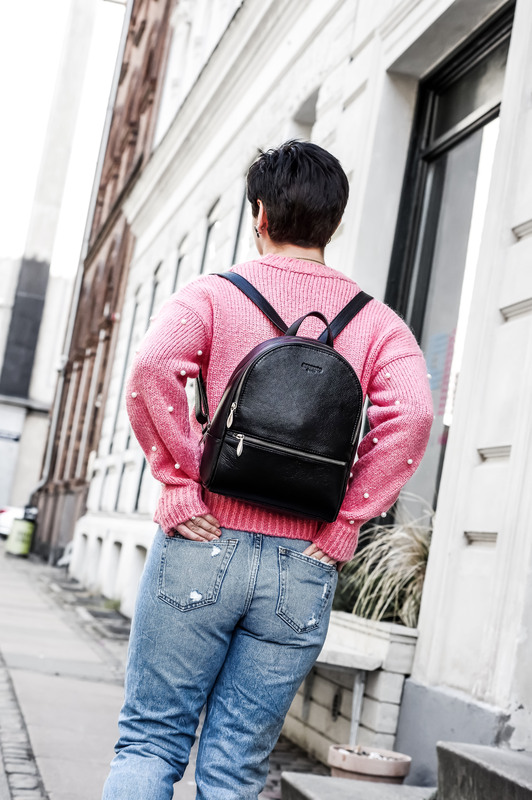 This backpack has all these qualities, in fact this particular model from their collection is handmade in full grain leather with cotton as a interior material and 3 big zippers, the kind of backpack that will help you make a statement. It does say mini backpack on their website and to be honest, I expected to receive a small tiny backpack where I could fit my passport and maybe a water? But their version of mini backpack it’s actually quite spacious. The backpack itself has 3 spacious compartiments with only 3 zippers where you can easily fit your lunch, camera and many other items. Personally, I am the kind of person that always forgets where I put my keys, phone and freak out like crazy if I don’t find my passport but this usually happens when I have a bag with a lot of pockets. With this one is much easier to organize your things and you also have interior pockets as well. The model itself is really minimal, simple with clean lines and a style that would fit very well not only a city break mini holiday but also for your work life or even a casual event. It is designed for the business woman that is always on the go and can easily replace a handbag if that fits you best. As I mentioned previously, this backpack has been with me almost everyday on my small trip to Milan and it was quite useful. I will keep on using it during my daily errands and for going to work as well. Personally, sometimes I am not in the mood to carry a handbag on my shoulder and I believe this is a great alternative. Since summer is just around the corner and we are planning our summer trips or packing for a summer trip, I thought this was the best time to present you an accessory that you can carry around and that will help you along the way. What do you think? ** This backpack was kindly gifted by Arsante of Sweden but all the opinions are definitely my own.